PLENT proposal for a single EU Directive on paternity/maternity/parental leaves: equal, non-transferable and fully paid leave for each parent! 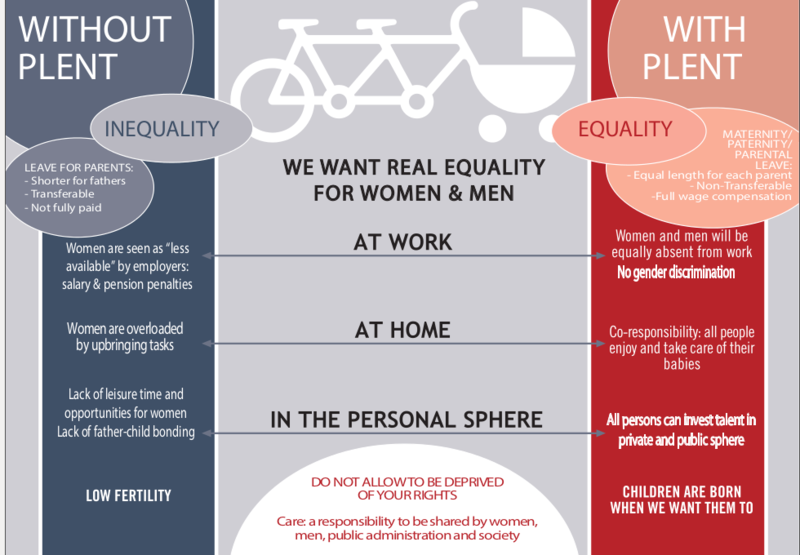 The Platform for Equal, Non-Transferable and 100% Paid Parental Leave (PLENT) expresses its concern about the persistent inequality between leave for fathers and mothers. This inequalit y reflects the idea that care is still considered a women responsibility. At present there are two different directives in the EU that are completely disconnected. One is the Directive on Maternity leave (92/85/EEC, under DG health), providing a minimum of 14 weeks with no loose of earnings for mothers. On the other hand, the Parental Leave Directive (2010/18/EU, under DG Employment) provides an equal period of time for each parent (4 months), but this period does not have to be paid and only 1 month has to be non-transferable. So, despite the “equality” and “protection” appearance, all kind of leaves in these two directives are actually designed for mothers and not for fathers: maternity leave because it is literally for mothers; parental leave because it is not paid and/or transferable. We believe that parental leave must be individual and not transferable, just like the rest of Social Security rights which are based on personal contributions. Empirical evidence proves that men tent to not taking the leave if they have the possibility to transfer it to women, whether for reasons of education or because they are forced by companies. Furthermore, all women are penalized by higher absences of mothers from work. Once both parents have equal and non-transferable leaves, these leaves could be increased together without compromising the goal of equality. While maternity and paternity leave continue to be unequal, increasing maternity leave would exacerbate the inequalities. – Establish that parental leave must be, for each parent, of equal duration, non-transferable in its entirety and without any economic loss. This reform is essential for European citizens to reconcile their personal and professional lives equally. Besides, this reform is not only affordable but also a very profitable investment to end with the actual situation in which employment potential of women is wasted, at the same time that men potential as caregivers is also wasted. With this reform, women and men would have more possibilities to have children and so fertility rates would rise. It is therefore a key reform on the road to a sustainable economic model. One Response to PLENT proposal for a single EU Directive on paternity/maternity/parental leaves: equal, non-transferable and fully paid leave for each parent!